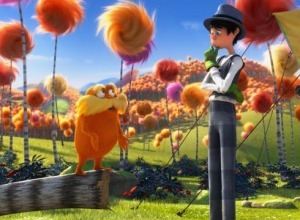 Last weekend, I had the opportunity to attend a screening of Dr. Seuss’ The Lorax before it hit theaters. The showing, sponsored by NEA and Mocha Moms, brought hundreds of DC kids to view the movie and learn an important message about the environment. One of the reasons why I like the Lorax book so much is because it’s about each of us can improve the environment around us. I used to think that saving the environment was something that didn’t have a lot to do with me. To me, the earth that I walked on and biked on and drove on seemed just fine. When I moved to DC six years ago, I moved into an apartment building in a neighborhood where people didn’t care too much about keeping the sidewalks and the streets clean. And because no one else seemed to care too much and because I was just one person, I didn’t think I could do anything about it. But then my nephew Matias was born and moved in with his mom and dad right across the hall from me. And even though Matias couldn’t walk or talk and pretty much all he did was sleep and eat and poop, I started to see my neighborhood in a different way. In a few years, when Matias is old enough to go to school, I want him to attend a school where every day, when he walks through the doors, he will know that his community made sure he could attend a school that would help him have a better future. And that was why I started the Center for Green Schools. At the Center for Green Schools we think that every student deserves to go to a school that is safe, healthy and clean. And we know that if we send our kids to these green schools - schools that teach them lessons about taking care of the world around them, schools that save energy and money by turning off the lights when there is plenty of daylight, or schools that water their grass with rain captured from the roof instead of water that comes from a sink or a hose - not only will they take better care of the places they live, they will teach others to do the same. Our goal at the Center is to green every school in the United States in this generation. That is a huge undertaking because there are 133,000 schools in the United States. But we can do it if you help us. You probably already help by teaching your children about the importance of taking care of the world around them. But you will help us if you help your school become a greener, healthier, safer place by hosting an event at your school on Sept. 29, 2012 during our first annual Green Apple Day of Service. You could plant a garden, or pick up litter on your school grounds, or change out old light bulbs for new ones that save energy, or paint a mural on a wall that encourages other students to go green. You can visit our website to get more information about our day of service, and how you, your friends, family and neighbors can get involved too. At the end of the book, the Lorax carves one word on a small pile of rocks: Unless. Unless someone like you takes the lead to green your school and your community, unless you get your friends to join in, and unless you do little things every day to conserve and preserve resources, we won’t be able to green every school in America, starting right in your own community. This piece ran in Parenting.com's Moms Congress.